Aerial Yoga but closer to the ground. Yin, Restorative and Therapeutics. Suitable for all levels of practitioners, these classes follow basic Hatha Yoga practices. 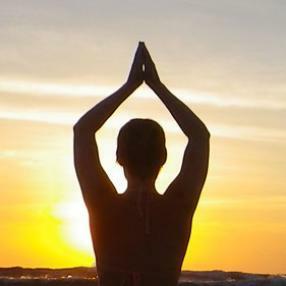 Hatha Yoga is the foundation from which all other forms of yoga have evolved. You will work through a variety of asana (poses), sometimes holding and sometimes flowing. All classes end with Savasana, the final relaxation, where you shift down to slower brain waves, helping to relieve stress while your body & mind integrate the work done in class and take you into a state of deep restoration & peace. Poses will be presented with a choice of variations to suit the needs of the beginner as well as the advanced yogi. All are welcome! Strengthening vinyasa flow in candle light followed by restorative poses. Perfect for unwinding after work. The stillness of Yin Yoga takes us deeper into our observing nature where we learn to find happiness, acceptance and more honesty with ourselves. Poses are floor postures that are held longer to encourage energy flow into the denser tissues of our bodies, bringing movement and flexibility into our joints. Following the Yin Yoga practice, we will enjoy a resting Yoga Nidra session that slows the brain waves while remaining awake, encouraging healing in the deep subconscious mind.